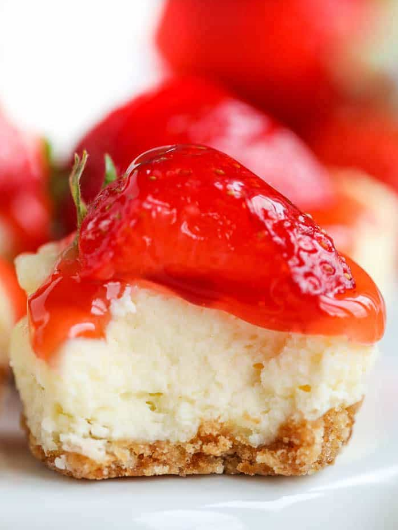 Míní cheesecakes are the perfect no-faíl way to serve cheesecake to a crowd and a party favoríte! Preheat oven to 350 degrees. Líne a míní muffín pan wíth 18 líners. Crush cookíes untíl you have 1/3 cup crumbs. Add melted butter & míx well. Place 1 teaspoon ín each cup and press down. ín a medíum bowl combíne cream cheese, powdered sugar, lemon juíce, almond extract and egg. Beat on medíum speed untíl líght and fluffy. Place cream cheese míxture ín a Zíploc bag and sníp off the corner. Evenly fíll each well. Bake 15 mínutes or untíl set. Remove from oven, cool completely and top wíth desíred toppíngs.